The Allstate Hot Chocolate 15k/5k is seeking energetic volunteers to assist with the Hot Chocolate Runner Expo and Race Day events. 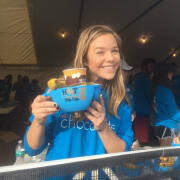 Volunteers provide key support to the thousands of participants as they "run for chocolate" and Make-A-Wish (r). With a variety of exciting and delicious positions available, there is a spot for everyone, including individuals, teams, school groups, corporate groups, friends and family. The Allstate Hot Chocolate 15k/5k is not possible without the help of all our amazing volunteers, so come out and join the fun.